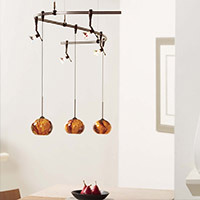 Our favorite ceiling light fixtures are those that 1) look great and 2) are easy to use. Both things are inherent in track, monorail and cable lighting systems. 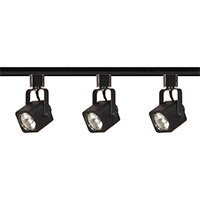 Track lighting systems have been the display lighting fixtures of choice for decades, with a row of adjustable spotlights set along a rigid, industrial-looking track. 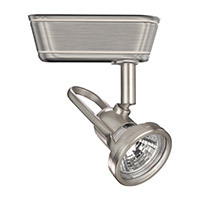 Monorail lighting systems provide even great lighting flexibility -- literally -- with bendable rails and an amazing selection of adjustable spotlights and decorative mini pendant lights. Both types of track and monorail light systems accommodate interchangeable elements, allowing you to mix and match to your heart's content. The modernity of the technology in general makes track and monorail lighting especially ideal in contemporary settings, for both residential and commercial spaces. 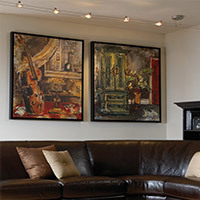 In the modern living room or great room, track lighting is the perfect option for highlighting artwork along the wall or for providing directional, display-oriented light over the media cabinet. A flexible track or monorail lighting system can also find its home in the kitchen, providing focused -- and adjustable -- light for multiple tasks, as well as overhead accent lighting. 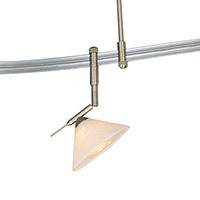 Cable lighting is a go-to choice for hallways and thoroughfares, where you need light spread across a long span of ceiling. And in hotels, restaurants, retail stores and other commercial locations, track, cable and monorail lighting directs your visitors' attention and adds eye-catching drops of color to a space. 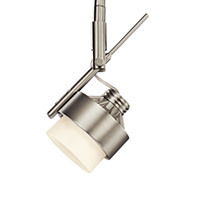 Whether your home is fashioned with modern decor or a more transitional and traditional style, you are sure to find a track and monorail light here that matches any interior's aesthetic. 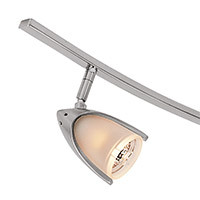 Transitional homes benefit from the track and monorail light fixtures by George Kovacs and Kichler, with a variety of popular metallic finishes including nickel, bronze and chrome. 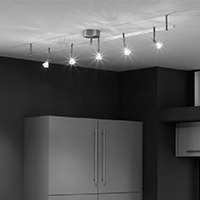 Kitchens and living rooms become instantly modern with fixtures by Tech Lighting and if you prefer energy efficiency in your space, look to the LED track and monorail lights from WAC Lighting. Finally, achieve an elegant, luxurious look with crystal track and monorail fixtures by Schonbek Lighting. Adorning shining crystals from Swarovski, these designs are guaranteed to impress. 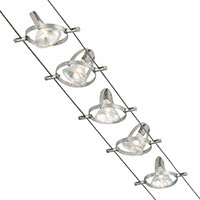 Track and monorail lighting is expansive in its selection of shapes and sizes. 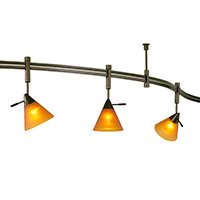 From large, multi-head track lighting systems fit for big, open living rooms to petite monorail lighting for a compact kitchen or breakfast nook, you are guaranteed to find a wide variety of decorative options in this assortment. And you'll find 2-circuit systems as well, giving you the versatility you need for any type of lighting scheme you are trying to accomplish in your space. Be sure to completely measure your ceiling before installing a track and monorail system and thoroughly review the fixture's sizing dimensions to avoid any complications. Keep in mind that monorail and cable systems can become quite long, so you'll need plenty of ceiling real estate to work with. Lastly, check the fixtures' brightess ratings and required bulb type to know just how much light output you can expect. If you think a system will be too bright for your application, you may consider putting the lighting fixtures on a dimmer switch. 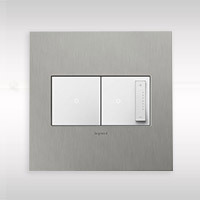 Easily complement your new lighting system with light switches, dimmers and outlets from the Legrand Adorne collectin. 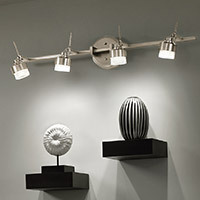 You can also achieve a similar focus of directional illumination with a wall picture light. Instead of installing ont he ceiling, most picture lights mount to the wall and allow for a directional wash of light on wall. 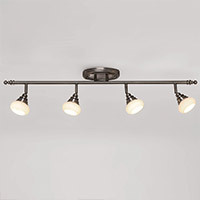 Check out all of the available fixtures you can use for hallway lighting and consider layering your choice of lighting with appropriately positioned wall lamps.